Ever since it was announced that the yellow pill-shaped things from Despicable Me were getting their own movie, the world has slowly suffocated beneath their ever-growing, indecipherable empire. Minions ruin Miguel lyrics. Minions swear at unsuspecting children. 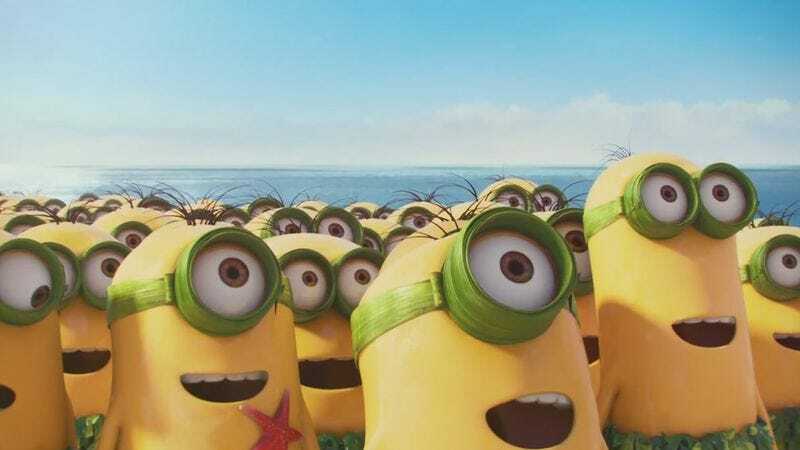 Somehow, Minions even spark sexist debates. It’s a goddamn epidemic. Now, according to Variety, enough people worldwide have watched their movie to bring Minions’ box office total to $1 billion, further boosting Universal’s record-breaking year. Minions has raked in $682 million internationally and $321.9 million in North America, making it the third-biggest animated film of all time behind Frozen and Toy Story 3. The records tops a nice fat week for Universal, which, also according to Variety, set records for top domestic year on August 26 with $2.113 billion and top international year on August 24 with $3.78 billion. Given that Minions still hasn’t opened in Italy, Turkey, China, and Greece, it’s likely those creatures’ weird, mostly bald heads will continue bloating insufferably for a while longer. Literally.